The last two decades have seen Marxism's academic renascence. In fields as diverse as law, literary criticism, history, and philosophy, Marxism once again captivates no small number of scholars. In part, this reassessment is driven by the efforts of a group of philosophers and economists to reconstruct Marx from the ground up on a more rigorous basis. The work of these "Analytical Marxists" — who include G.A. Cohen, Jon Elster, and John Roemer — is given a sustained examination and critique in David Gordon's Resurrecting Marx. The charge of the Analytical Marxists that capitalism is inherently exploitative and unjust is the primary subject of Gordon's book. Gordon takes issue with that contention; he argues that the Analytical Marxists' withering criticism of classical Marxism is essentially correct, but that they fail to replace it with a superior theoretical edifice. 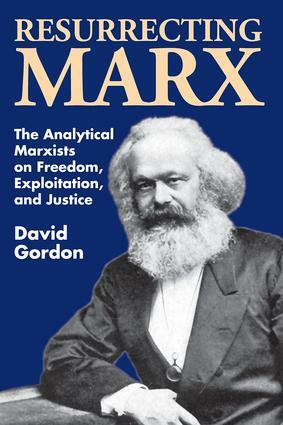 Gordon also analyzes the Analytical Marxists' reformulation of the Marxian notion of exploitation, the implications of their rejection of the labor theory of value, their differences over what rights people have, and their arguments for the compatibility of markets with socialism.